People often have unpleasant things to say about Valentines's Day, because we can't stand the idea of forced, frilly, fluffy romance. When I decided to have Love Week here, romance was not a part of it at all. Love week is about cute and crafty, the things and people we love, and the many ways we can express that love, and it will continue to be that. But even though these things are fun, they're still kinda frilly and fluffy. What is love really? That is love. Serious love. The kind of love that would give anything and everything for someone. My everyday life doesn't usually encounter the kind of situation that would require me laying down my life for another, but it does bring opportunities for small sacrifices. Can I show love by walking away from my computer and doing the dishes instead? Can I love another person enough to not say what I'm thinking? Can I demonstrate my love of God by memorizing His words? Those little acts of love can feel as difficult as the big ones. But I'm working on it. At the risk of going off-track, I want to share a quick craft to go along with one of these little ways of showing love. (It's a bit frilly, but with a deep intent.) We made some little magnets for our fridge. 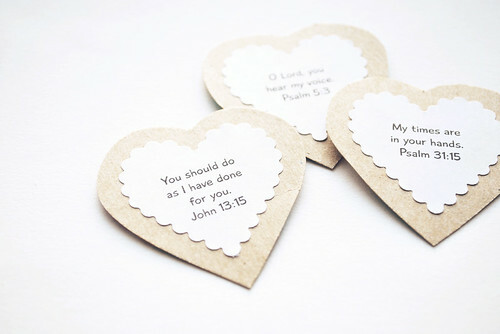 They have short scriptures printed on them, and I'm going to make an effort to learn these, and add to them. Perhaps you'd like to as well? Print out some short verses in a small font. Cut or punch a heart shape around the verse (I used my new Fiskars scalloped heart punch). Glue the heart onto cereal box cardboard. 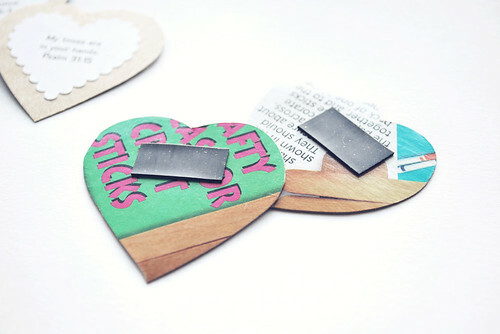 Cut around the heart shaped, then add a magnet strip to the back. You're ready to take God's Word to heart! 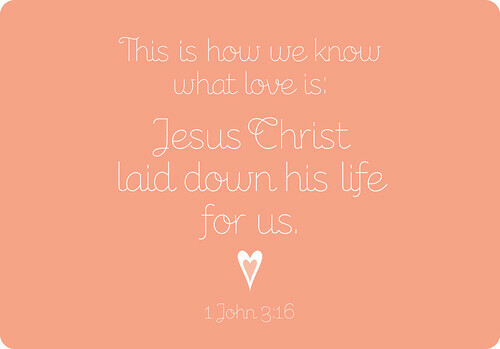 And if you'd like a reminder of what love is, feel free to download the "this is how we know" image, and print it out. Keep it handy and think about what you're doing to demonstrate love, real love, to your family, your friends, your community, your God. Beautiful! Printing that one out for our fridge right this minute. keep sharing His word, Mollie! Lost_Button: I use Adobe Illustrator. Thank you so much for sharing, Mollie! This is really one of my favorite posts ever, wonderful job! I love these Mollie! Thank you so much - such a great message!!! LOVE this! What a awesome valentines day card! There is no greater LOVE then His love! Thanks Mollie! I just found your blog and wanted to download your lovely "This is What Love Is" printable. However, I am getting the message that downloading is disabled. Is there I way I could still get it? It would be a perfect reminder in my home right now! Kirsten: Sorry about that! The settings have been adjusted and you should have no trouble now.